2003-2004. Covers of The New York Times Magazine, Le Monde and Time. Following the 1990s when the gastronomy critics honoured us with distinctions that we feel very proud of, perhaps the highlight of what occurred from a press viewpoint in the first decade of the 21st century were the inroads made by cooking in general interest publications, in other words, non-cooking magazines. 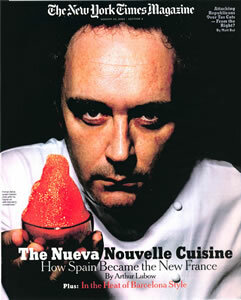 In 2003, Ferran Adrià, together with the new Spanish cuisine, was the 14-page cover story of The New York Times Sunday supplement. 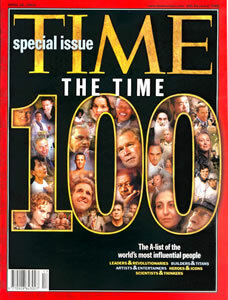 A few months later, in 2004, it was the Le Monde supplement that devoted its cover and an article to Ferran, while Time magazine included the elBulli chef in its list of the top 100 influential people in the world, in all fields. 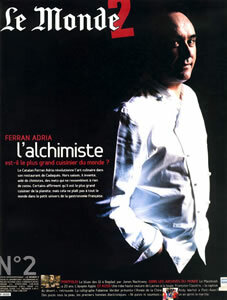 It is fair to say that the public profile of Ferran Adrià and elBulli underwent a radical change because of these three covers.